Boomerang is an agent with U.S. Army Intelligence. His real name is Lloyd Raleigh and he holds the rank of captain in army. We learn on the first panel that he "pledged ... to eradicate scourges of modern civilization" and he eagerly accepts his first assignment. His mission is quite straightforward as explained by his boss at Intelligence when he says, "in our desire to free the oppressed world of sadistic killers we must eliminate them one at a time." So Boomerang is really an assassin. It on his first mission, one takes him into Berlin, flying a captured German plane and speaking German like a native. It also gets him thrown into prison and it is there that he takes a moment and changes into his costume (no word as to where he had hidden the outfit). Suddenly, one of the other prisoners calls out his codename, "Boomerang! ", in surprise. Keep in mind that this was his first day of his first mission flying from England to Germany and already those locked up awaiting execution knew of him. That is impressive. Not so impressive is his outlandish outfit. Very short shorts (really a Speedo before its time), a torso-tight tshirt, a waist-high cape, swashbuckler boots, thick gloves, and a big floppy hat complete with a feather. All either black or green in color. And draped around him is a strap holding a small supply of boomerangs which he can throw with deadly accuracy. His fellow prisoners do not seem the least bit surprised at his change of clothing, though. During his first adventure while he was in a prison awaiting execution, he meets a fellow inmate, the lovely British citizen Diana. What she was arrested for is not known but what the nasty bad guy holding her intended was not so mysterious. She was present when he changed into his Boomerang garb so she is aware of his identity. From his second adventure on, Diana opts to join him and seeing that she was England's bow and arrow champion before the War, she turns out to be a pretty lethal addition to the job. The second mission has Boomerang able to impersonate a Japanese pilot, not an easy task. It also has him flying a Mitsuibishi aircraft and speaking Japanese as well as he spoke German before. Of course, his ruse is discovered through no fault of his own and he is about to be killed when a arrow comes whizzing from nowhere and Diana, who had snuck aboard the plane, dressed in a costume even more eye-catching than Boomerang's, calls out for him to "come forward". When he does, he has whipped off his outer garb and assumes that of Boomerang (where the hat was hidden is not explained). Raleigh and Diana (we never learn her last name) are in California when the third recorded adventure takes place, having a bit of R&R which, apparently, they need. For the fourth and final romp, they are in Burma. (As her cover for going wherever Captain Raleigh goes, Diana takes the job of a war correspondent.) They certainly get around. As an action team, Boomerang and Diana (she never gets her own codename) make a pretty good team. He is most definitely the brawn and she is without question the brains and yet he gets top billing. She gets the spiffier costume. It is at the end of the final adventure that we learn Raleigh has been given orders to head elsewhere and he and Diana must part company. She says she will wait for him to come back and perhaps Boomerang and Diana will again see action. That has not yet happened. A very short-lived series is that of Boomerang. When you have read those tales, you will likely see why there were not many done. 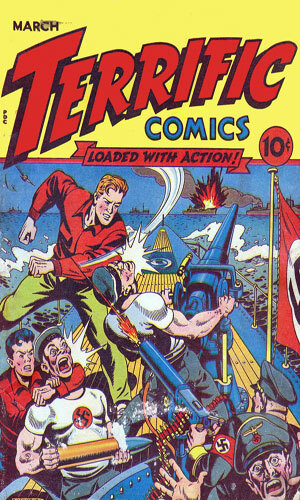 From Terrific Comics #2 - Boomerang is given his first mission - fly into Berlin as a German pilot with a message from the Fuhrer, find a murderous despot who likes chopping off heads, and eliminate him. Along the way he saves another prisoner named Diana. 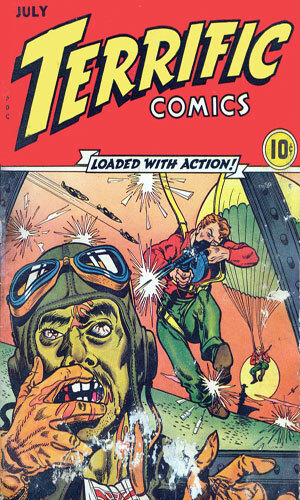 From Terrific Comics #3 - Boomerang is sent to Japan to get revenge on the man who ordered the execution of American pilots. Joining him in this adventure is Diana, the British woman saved in the previous tale. From Terrific Comics #4 - Raleigh and Diana are sailing off the West Coast when they discover a submarine shelling a refinery. Investigating, they learn that German sympathizers, led by a German film director, have captured an American sub and are using it for sneak attacks. 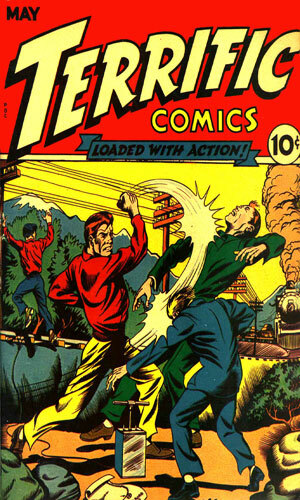 From Terrific Comics #5 - In Burma, Boomerang's boss, the Colonel, is hypnotized by a Japanese scientist who needs test subjects. Luckily Boomerang and Diana suspect something is up and can save the day. It is not hard to tell from my write-up in the About the Series section that I did not think much of this series, hence its low grade. Logic plays no part in anything that happens. The get-up Boomerang wears is insanely goofy, though being typical male, I liked Diana's outfit. Who or what he is supposed to be makes little or no sense. And the separation of the two is odd. Diana is in Germany when Boomerang is first there. She follows him to Japan. She vacations with him in California. She is on assignment in Burma alongside him. Now, though, he is heading elsewhere and she cannot go. Maybe they had a fight. There is no wonder this series did not last long. It was meant as filler in the comics and it was not good at it.